A member of the firm negotiated a 15-year sale/leaseback and acquired the Steelcase Building, a 125,134 net rentable sq. ft., eight-story Class A office building constructed in 1989. 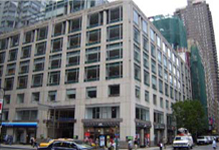 The Property is located at 4 Columbus Circle, New York, New York on the southwest corner of the intersection of 8th Avenue and West 58th Street. The Property consists of both office and retail space.